Stellar writing and a host of small improvements help Borderlands 2 stand tall on the shoulders of its predecessor. Despite your fresh foes, the core combat remains very much the same. Scoring critical hits and dealing the right kind of elemental damage can accelerate the demise of your enemies, and the fight-for-your-life moment can save you from your own imminent death if you manage to get a kill as you bleed out. The shooting mechanics are solid and satisfying, but action is largely unchanged from the first game, with the exception of slag. Slag is an element that weakens enemy defenses and amplifies damage from the other elements, making it a powerful tactical asset in many situations. The four new characters also require new tactics to better leverage their new combat abilities, some of which are more exciting than others. Locking a foe up in a magical floating prison as a siren is more glamorous than simply whipping out another gun as a gunzerker. Though the latter has undeniable combat benefits, gunzerking is the only ability that doesn't offer something different from the core gunplay, merely an amplified version of it. The commando's turret adds a deployable asset to your arsenal that draws enemy attention, while the assassin's deception skill sets a decoy and lets you maneuver invisibly to set up for a damaging shot or melee strike. Each of these base abilities can be customized in substantially different ways through the three different skill trees, enhancing replay potential even if you want to play as the same character. 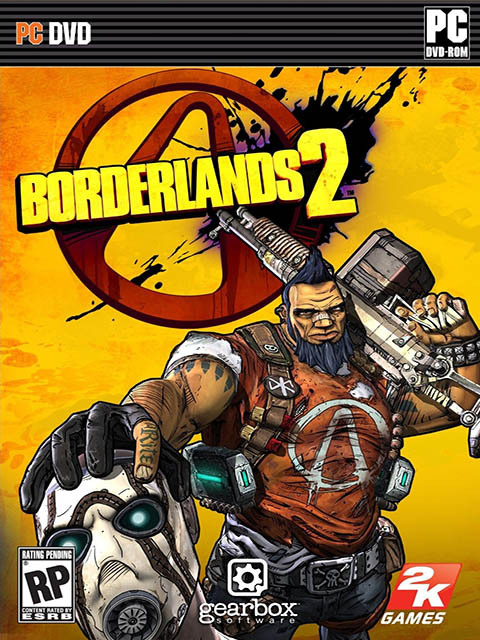 Though some skills favor certain weapon types, weapon proficiencies do not return in Borderlands 2, removing the incentive to stick with one or two weapon types throughout the whole game. You also have more freedom to tweak your character's appearance, as clothing colors and new heads are now loot items you can collect, and the menu gives you the welcome chance to actually see the results. There are lots of choices to make en route to the level cap of 50, but if you hope to max out, you have to start from the beginning in True Vault Hunter mode, a deadlier playthrough that scales to your level and stocks the fields and caves of Pandora with some gnarly new enemy variations. Borderlands 2 provides a lengthy adventure, and one that gets better when you play it with friends. As before, online games can accommodate up to four players of any character class. A small icon denotes how well you are matched with potential players, and though the difficulty attempts to scale appropriately, it's best to play with someone close to you in level. If you accomplish later missions while someone else is hosting the game, you'll be given the option to skip those missions when you reach them on your own, which helps minimize the redundant play that was often the result of joining online games in Borderlands. A new item trading mechanic, tougher enemies, better rewards, and the excitement of battlefield camaraderie make cooperative play the absolute best way to experience the game. Now if all this sounds familiar, well, you must have played Borderlands before. Borderlands 2 doesn't reach far beyond its predecessor's scope, but it does do almost everything better. Additions, refinements, and fixes all combine to create an appreciably improved experience, one that fully delivers on the promise of the first game. While Borderlands felt empty at times, this sequel is bursting with content and brimming with life, making it an absolutely delightful way to spend hours and hours and hours of your free time. Last edited by PirateBoy on 14 Aug 2013, 15:10, edited 1 time in total. Last edited by Username1 on 14 Aug 2013, 15:10, edited 1 time in total. just out of curiosity,is it poss. to remove the cartoon effect from borderlands2? san andreas has an enb series effect.txt file from oCain's-Effect-Pack,that changes the game to look abit like borderlands 2 cartoon look. Last edited by donkeymilk on 14 Aug 2013, 15:10, edited 3 times in total. If you wish to remove the 3D Cel-shading, you must change the settings below. You can also set the file to read-only, but this is not necessary.